explore your own potential for entrepreneurship. Already have your JD? Learn more about the nine-month, residential LLM in Law & Entrepreneurship. The dual JD/LLM in Law & Entrepreneurship (LLMLE) program is a unique experience - the only one in the country - where law students can learn the tools and thinking to work effectively with entrepreneurial ventures. Building on Duke Law's existing strengths in the fields of business law, intellectual property law, and innovation policy and strategic ties to entrepreneurial companies located in nearby Research Triangle Park, the Law & Entrepreneurship Program offers a distinctive and rigorous educational experience. 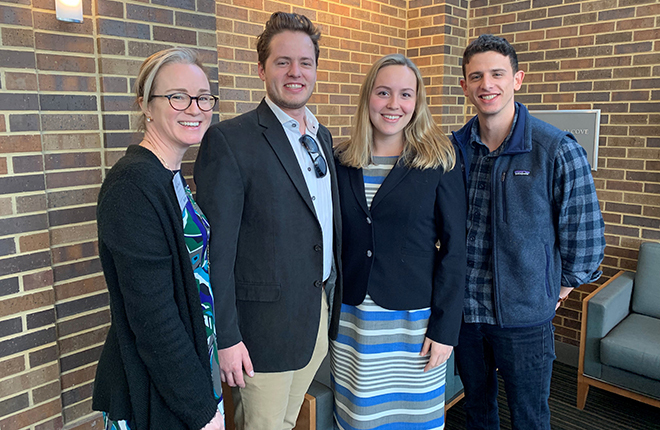 JD/LLM in Law & Entrepreneurship students complete requirements for both degrees over six semesters of law study and a startup immersion experience during the summer following their first year. Required courses include Advising the Entrepreneurial Client, Law & Entrepreneurship, Analytical Methods, and Business Strategy. JD/LLM LE students also participate in a non-law firm externship at a local startup company and/or the Start-up Ventures Clinic. Additionally, up to three classes may be taken outside of Duke Law, with permission from Academic Affairs. Students who have a business idea are encouraged to take classes for credit through Fuqua School of Business through the Program for Entrepreneurs, where you’ll work alongside an MBA student and another peer to launch your business over multiple semesters. To apply for the JD/LLM in Law & Entrepreneurship program, candidates complete the regular JD application and indicate their intent to enroll in the JD/LLMLE. No additional application materials or standardized testing are required. Candidates for the JD/LLM in Law & Entrepreneurship do not need to apply separately to any school or program at Duke other than the Law School. Complete the regular JD application, but indicate that you wish to be considered for the dual degree. You may apply to only one dual degree program. Applications to the dual JD/LLM in Law & Entrepreneurship are reviewed through the regular Law School process. Although there are no specific prerequisites or admission requirements, the admissions committee pays particular attention to applicants with a background in business, finance, and entrepreneurial activity. In rare instances where the applicant is a strong candidate for the JD program but lacks this additional experience, the admissions committee may offer admission to the JD only. JD/LLM in Law & Entrepreneurship candidates are not required to submit a statement of purpose for the LLM; however, we encourage applicants to address their interest in law and entrepreneurship, either in their personal statement or include the JD/LLM Addendum attachment. The LSAT is required for all Law School dual degree applicants. No additional testing is required. 7 of these credits will also count toward the 87 JD credits. The applicable courses are Securities Regulation (4 credits) and Business Strategy for Lawyers (3 credits). The remaining 14 credits are in addition to the 87 credits required for the JD. *Note: Joint degree students will take Constitutional Law in the fall of 2L year. For JD-LLM-LE students, Constitutional Law is replaced with Business Associations in the spring of 1L year. LE Summer Program: Completion of the Entrepreneurship Immersion course during the summer between 1L and 2L year. JD Ethics Requirement: A two-credit course in ethics and professional responsibility. JD Substantial Research and Writing Project Requirement: One faculty-supervised research paper for a minimum of two credits. This may be fulfilled by way of a seminar or an independent study. The SRWP paper must be a solo project; group projects may not be used to fulfill the requirement. The student's engagement in a substantial research and writing project must be registered with the Registrar's Office no later than the end of the drop/add period of the student's fifth semester. Courses that satisfy the SWRP are identified in the Course Browser by using the JD Course of Study drop-down menu and searching for "JD - substantial research and writing." JD Experiential Learning Requirement: A minimum six credits in simulation courses, clinics and/or externships. Courses that satisfy the Experiential Learning Requirement are identified in the Course Browser by using the JD Course of Study drop-down menu and searching for "experiential learning." Prescribed courses within the JD-LLM-LE curriculum that count toward the experiential learning requirement include the following: Community Enterprise Law Clinic, Deal Skills for the Transactional Lawyer, Negotiation, Start-Up Ventures Clinic, and The Way it All Works. JD/LLM-LE Electives: students are expected to maximize the value of the JD/LLM-LE program by selecting JD courses with a total of at least 16 credits to complement the prescribed program curriculum. LE electives are identified in the Course Browser. Regularly-Scheduled Courses: A minimum 64 of the 101 credits must be earned in law courses that require attendance in regularly scheduled classroom sessions or direct faculty instruction. Rosie McKinley JD/LLMLE '17 and Katie Hasnain '18 of Duke Law’s Start-Up Ventures Clinic led the session by sharing strategies on when startups should seek legal advice. McKinley shares her experience being in the dual degree program for Law & Entrepreneurship. Trevor Kiviat, JD/LLMLE ’16, is able to feed his interest in entrepreneurship while completing three years of law school. Dyna Zekaoui, JD/LLMLE ’16, is a member of the first joint degree cohort.